Rare map of the Marches of Alexander the Great. A rare 1829 John Thomson historical map illustrating the Battles and Marches of Alexander the Great. Centered on the Caspian Sea, the map cover from the Adriatic Sea to Indus River Valley and from Crimea to the Red Sea, including all of the modern day Middle East, as well as Persia (Iran), Afghanistan, Turkey, northern Arabia, Israel / Palestine, Syria, Jordan, Greece, the Caucuses, etc. Route markings show both the marches of Alexander the Great into Persia as well as the voyage of Nearchus, a Navarch (Admiral) under Alexander the Great, from the Indus River to the Persian Gulf. Additional routes noted include the March of Hephestion and the March of Craterus. At the top of the map, three additional maps detail strategies employed by Alexander at three historic battles: The Granicus, Issus, and Arbela (Battle of Gaugamela). 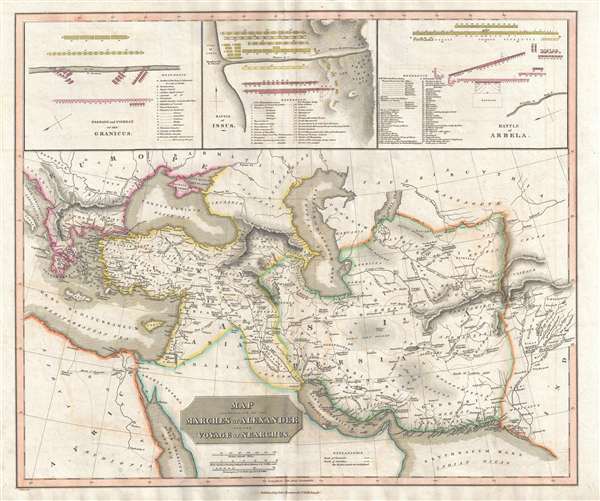 This map was published by James Wyld and John Thomson for Thomson's 1829 New Classical and Historical Atlas. This atlas, and the maps it contains, is quite rare as the OCLC identifies only 3 examples. James Wyld's imprint appears in the lower left making this an exceptionally early example of his work. Thomson, J. New Classical and Historical Atlas, (Edinburgh) 1829. The New Classical and Historical Atlas is one of John Thomson's rarer works. The atlas was issued in concert with James Wyld and follows stylistically on Thomson's better known work from the New General Atlas. It was published in 1829 and contained 49 hand colored imperial folio maps. When it was originally issued the atlas cost a whopping 8 guinea. This atlas, though grand, must not have been exceptionally popular as Thomson was driven into bankruptcy one year later in 1830. Sales may have subsequently increased as his finances appear to have marginally recovered only to slump again in a second bankruptcy filing in 1835. Around this time Thomson sold the plates of this Classical Atlas to A. K Johnston. There is some evidence that Johnston considered republishing it from the original Thomson plates in 1835, but no full examples of this work survive. Very good. Light transferrence. Original centerfold exhibits some wear.